This great doctor of the church was born the son of the count of Aquino in 1225. The little boy studied at a Benedictine Abbey. Even as a small child his mind pondered great theological questions. He was later sent to the University of Naples where he studied under Peter of Ireland. 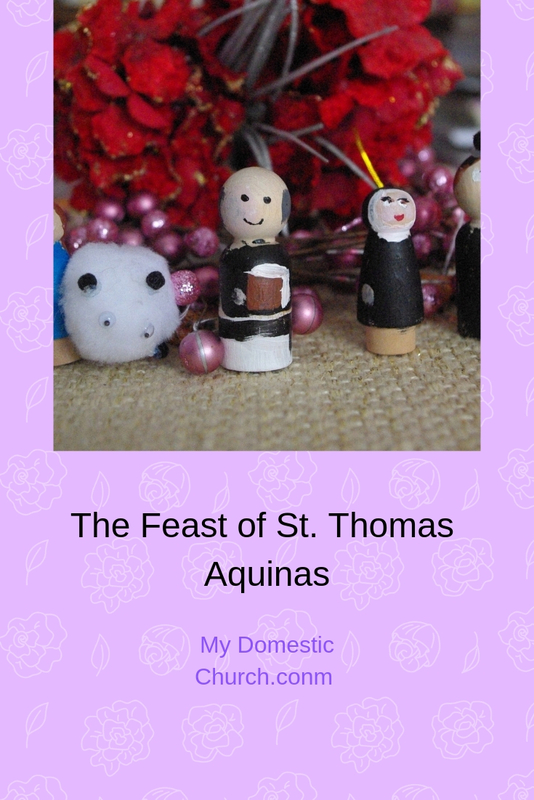 As he became older, Thomas grew in his love for God and the apostolic life. 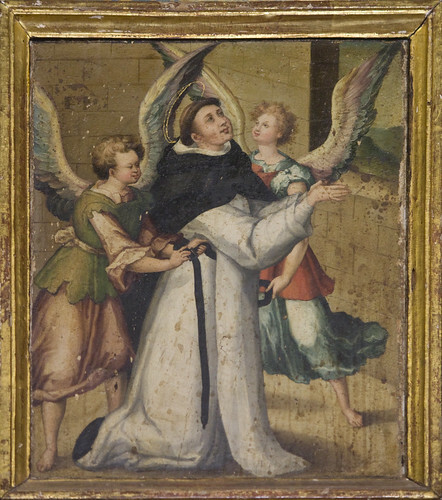 He petitioned the Dominicans for acceptance but was told to wait until he was 18 years old. His family was less than thrilled with the prospect of their brother becoming a religious. He was literally kidnapped by his brothers and locked away in a tower for a year. His brothers sent a prostitute to tempt him, but it is said that he drove her out of his room with a burning brand. Legend says that angels came down to gird him with the cincture of perpetual chastity. The chastity of St. Thomas by Father Lawrence Lew, OP via Flickr licensed by cc. His sisters came to plead with him to find another life, but Thomas was able to convince them that his vocation was real. They eventually helped him to escape his tower prison and return to the Dominicans. Thomas studied in Cologne and Paris. His great mind made him an intellectual prodigy. Maybe his gifts, as well as his size, made him the target of bullying and mocking. Because he was so large and silent his classmates thought he was stupid and called him a Dumb Ox. said of him, “We call this man a dumb ox, but his bellowing in doctrine will one day resound throughout the world." Thomas was a great teacher and preacher. He did a remarkable amount of writing and traveling. He died while on the road to the Council of Lyons in obedience to the Pope's command. 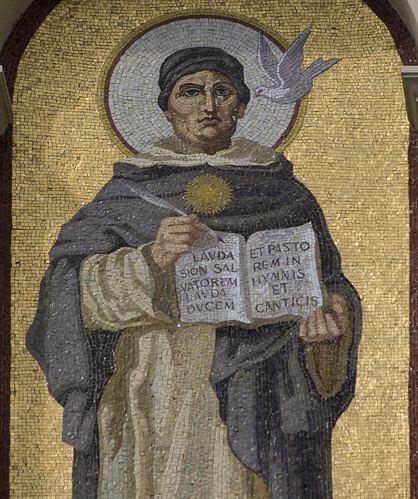 St. Thomas Aquinas by Dr. Lawrence Lew OP via Flickr licensed by cc. St. Thomas's greatest work is the Summa Theologica - available on Kindle for 99 cents! Two of my favorite stories about the saint! 1. St. Thomas Aquinas was walking outside and two nuns rushed up to him with a great big bound tablet. They asked St. Thomas if he would be so kind, in his spare time, to write out all that was necessary for the nuns to do so that they could make it into heaven. St. Thomas graciously agreed and took the volume from the sisters. They were very grateful and left with high hopes that perhaps he could finish this big task within a decade or so. To their great surprise, St. Thomas showed up the next day, with the tablet, and told them that he had finished the work! The nuns were stunned, but they thanked the saint and took the volume, rushing back to the convent to see all of the words that he had written. How to Get to Heaven - Will It!!! In other words (quite a few more "other words!") we all have the ability to make it to heaven, but we have to want to do so, and we have to will ourselves above and out of our own way to get there! It took place in the monastery where certain persons enjoyed making fun of the saint's weight problem. "Quick, Brother Thomas", they called from upstairs, "There's a pig flying around outside. Come to the window and see. Hurry!" As the saint puffed and panted to the window snickers were barely stifled. "Come, now, Thomas, surely you didn't really think there was a pig flying outside?" they teased. The saint replied, "I would sooner believe that pigs can fly than that my own brothers in religion could be uncharitable." "Nor has the Church failed before the assaults of demons: for she is like a tower of refuge to all who fight against the Devil."